The island of Grenada is located just 100 miles north of Venezuela. Early on this southernmost Caribbean oasis earned its nickname as The Isle of Spice, as shiploads of cinnamon, mace and clove made their way across the Atlantic to satisfy the European demand for the exotic aromas and tastes of the New World and beyond. 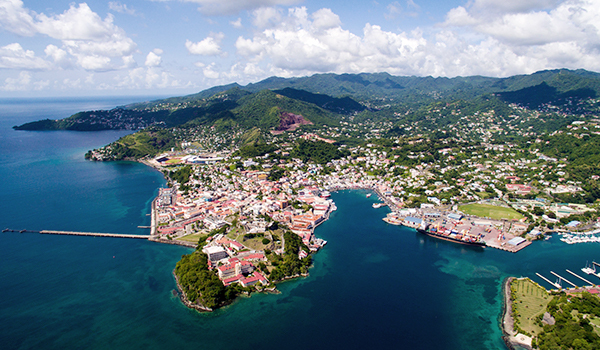 Visiting the main island of Grenada is like sampling the culture and history of three continents over the course of half a millennium. The influence of French, Spanish, African and native Amerindian culture and history is everywhere. Although the official language is English, most Grenadians speak a Creole or English dialect that contains a colorful mixture of words from each period of the island's history. Grenadian customs have evolved as much from its lush tropical environment as from the mixture of cultures that settled here. The strong traditions of dance and drum are gifts from Africa. The annual Carnival, originally held in February, is most likely derived from traditions of the Catholic Lenten season. This now takes place in August each year. Just as at Mardi Gras in New Orleans, the Grenadian Carnival historically provided the means for common folk, and even slaves, to openly mock the forces of authority. The tradition continues today in the jouvert celebrations held in the early hours of Carnival Monday.